Opponents see PLUC as an extension of Alderman Solis and largely a justification for the choices he makes in the community. Over the past year, tensions between the community, Solis, and PLUC have been on the rise as Pilsen has become increasingly unaffordable and gentrified. According to Lauren Nolan, economic development planner at University of Illinois at Chicago, since 2000, after adjusting for inflation, rents in Pilsen have increased by twenty percent. The community at large has lost over three million dollars in affordable housing—a loss many attribute to PLUC allowing developers to bypass the twenty-one percent affordable housing mandate in Pilsen by paying fines or providing other non-housing related benefits to the community. For the past year, the Pilsen Alliance, a grassroots anti-gentrification group, has been organizing community members to demand transparency from PLUC and answers to their questions regarding how and why they have allowed developers to skate by without providing affordability to the community. They have largely been ignored or blocked by the members of PLUC. Last month, the Pilsen Alliance’s Youth Committee held a meeting at the Rudy Lozano Public Library to discuss PLUC, what should be done to gain access to what they are doing, and what bylaws they follow. All members of PLUC—and Solis—were invited. None of them showed. The feud between PLUC, the Pilsen Alliance, and the community at large is not a new one—rather, it is an extension of a decades-long debate around transparency and accountability when it comes to development and gentrification in Pilsen. PLUC is in fact the third iteration of a fight started nearly two decades ago by the Pilsen Alliance and its allies over open community meetings around zoning, development, and what a “successful” community looks like. In the early 2000s, Pilsen was ripe for development at the height of the real estate boom. Single family homes were being demolished in favor of upscale condominiums, warehouses were becoming lofts, and long-term residents were being pushed out due to rent and tax increases. Solis, a political insider who in 1996 was appointed alderman by then-Mayor Richard M. Daley even though he didn’t live in the ward, was at the forefront of this trend. He pushed for construction of large-scale development projects such as a 130 one- and two-bedroom condominium building, and designating much of the neighborhood as a tax increment financing district (TIF) for large projects involving industrial buildings. His intentions, according to many activists and housing organizers, were very clearly to transform Pilsen from the perceived “blighted” community some saw it as to a bustling neighborhood akin to glitzy Wicker Park. 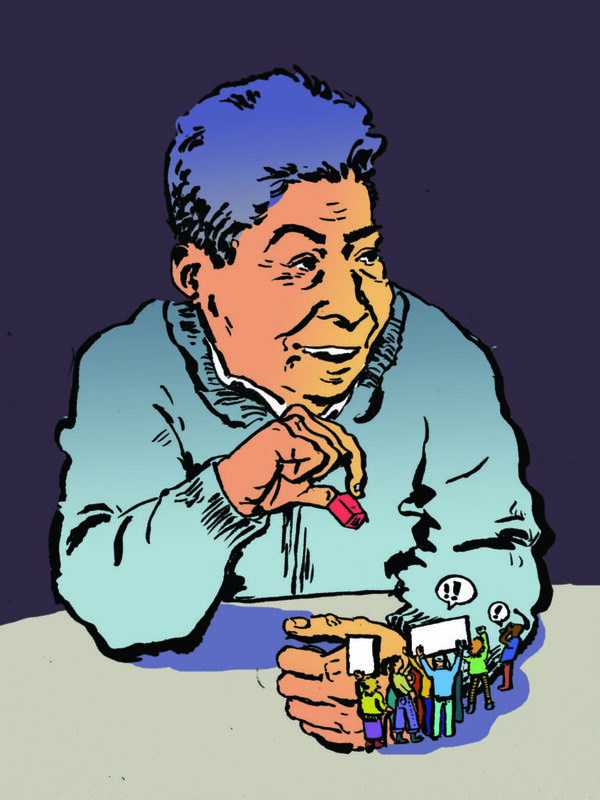 In March 2004, after years of conflict with Solis over his decision-making, a coalition of over twenty neighborhood groups and hundreds of Pilsen residents passed a sweeping yet non-binding referendum, requiring public input before any large developments or changes could be approved for construction. 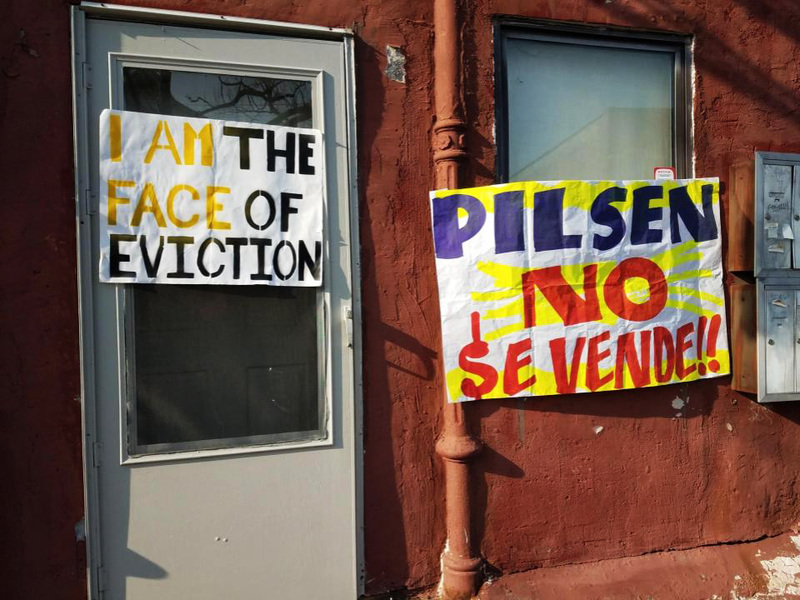 The referendum, called “Pilsen Is Not For Sale,” passed with over ninety-five percent of the community voting in favor, demonstrating the escalating tensions between the community and Solis. When asked about the substantial win for the community, and his take on the referendum, Solis told the Tribune, “The referendum is almost like, ‘should mothers take care of their children?’ The answer to that is yes.” A response like this assumes two things from Solis: that he had already been functioning in a transparent way with the community, and that going forward he would be in compliance with the new policy. Both of these assumptions, according to residents and activists, have proven false. Solis, for his part, did not respond to requests for comment for this article. Resulting from the successful referendum, community members and local nonprofits established a nineteen-member Pilsen Community Zoning Board (PCZB) to field development proposals. The board was comprised of members from the Pilsen Alliance; Alivio Medical Center, a free neighborhood clinic; The Resurrection Project (TRP), a developer of affordable housing; the longstanding Pilsen Neighbors Community Council (PNCC); the Eighteenth Street Development Corporation (ESDC); social services nonprofit Mujeres Latinas en Acción; community art studio Pros Arts (now known as EleVarte); environmental justice nonprofit the Pilsen Environmental Rights and Reform Organization (PERRO); and a handful of individual community members. However, the Zoning Board started unraveling almost immediately. The first case the group was presented with was a conflict happening over what was to be known as the “Chantico Lofts,” one of the largest condominium proposals at the time in Pilsen. Those in opposition feared that, if approved, Chantico Lofts would “open the floodgates to more high-priced housing,” the Tribune reported at the time. According to a 2010 article written by DePaul University geography professors Euan Hague and Carrie Breitbach—who were involved in the “Pilsen is Not for Sale” campaign—the PCZB was divided, with real estate groups such as ESDC and TRP speaking in favor of the development, and more grassroots groups such as the Pilsen Alliance and PERRO condemning the projects as a force of gentrification and displacement in the community. The disagreement between the activist groups and the developer came to a head at a public meeting held to discuss the proposal. At this meeting, PCZB members in opposition to the development publicly called out the developer for failing to consider affordability and greenspace in its plan, two issues that had been discussed at length in prior meetings and demands. Following the disbanding of PCZB, a series of high-profile public disagreements between community leaders, Solis, and the PPC regarding large developments in the community played out in Pilsen. The most significant battle was fought over a proposed 387-condominium building sitting at the corner of 18th and Peoria—a lot many will recognize still stands vacant today—then called Centro18. Much like the Chantico Lofts, Centro18 was thought to be a catalyst for gentrification in the community, as even the units deemed ”affordable” were well outside the price range or size most Pilsen residents could afford or needed, and the “greenspace” was better suited to singles looking to jog rather than for families to play on. Worse still, Solis’s office and the city had extended the boundaries of the TIF district to include the lot so as to capture the property taxes from the development, the Reader reported in 2005. After a series of protests led by the Pilsen Alliance and other community members calling for more consideration into how this development would affecting the existing community, “the Alderman’s office, and…the organizations that had founded the PPC following the PCZB split spoke out in favor of the proposals,” DePaul geographers Hague and Breitbach wrote, all but flat-out ignoring the pleas of the community to reconsider the consequences the development may have on the longevity of the existing community. The development was approved, but it was soon revealed that the developer of Centro18 had made about $19,000 in donations to Solis’s ward organization between 2006 and 2007. After the approval of Centro18, and the demolition of a massive wholesale fruit distribution factory and several single-family homes on the site, the economy tanked. The project was never realized—leaving the two-block vacant lot still visible today. What is meaningful about the Centro18 as it pertains to PPC is that it was the first large-scale development project proposed after the disbanding of PCZB, and PPC’s first opportunity to weigh in as the “community voice” and prove their autonomy from Solis. Acknowledging that Solis likely approved this development largely because of the campaign contributions—or potential for them—and that PPC did seemingly nothing to persuade him otherwise, activists believe the decision was made entirely by Solis, with PPC serving as a mere show of approval rather than a legitimate advisor. According to former PCZB members, PPC made no public statements during this time regarding why they decided in favor of Centro18—just that they were in agreement with Solis. In 2006, the PPC elevated their role in the decision making process by designating its members as the governing body for a new affordable housing policy in Pilsen. Two new guidelines were established for housing development in Pilsen in the 2006 Quality of Life Plan, a joint effort by the PPC and the Local Initiatives Support Corporation. Going forward, all new developments of a certain size were required to have twenty-one percent of units set aside for families earning sixty to eighty-five percent of the Chicago-area median income, and a new group known as the Pilsen Land Use Committee (PLUC) was to oversee it. The document says that “some of the members of the Pilsen Planning Committee have formed the Pilsen Land Use Committee, which is working with Solis to incorporate affordable housing into new developments.” However, the PPC and PLUC have identical membership. Much like its predecessor, PLUC has been consistently secretive about how closely it aligns with Solis, what projects it consults on, and how it determines its final decisions. Based on projects approved and completed since its creation, it would appear there is a great deal of discussion happening behind the scenes. After several requests for an interview, a spokesperson for PLUC and the Resurrection Project told the Weekly that PLUC members had “informed [him] they are working on compiling a report of their findings and what they have been working on for the last year set to be released the first week in January. Until then, they are unable to give any interviews to the public or the media.” PLUC has not published any reports in 2018—or ever. In 2016, PLUC made what is likely its most controversial decision to date: the approval of the development of a new ninety-nine-unit condominium building at 1414 W. 21st St. While the size of this building certainly falls within the mandate for twenty-one percent affordable housing, PLUC agreed to the standard citywide ten percent requirement for this project. Their rationale for agreeing to halve the neighborhood’s affordable housing requirement was that the developer provided a “substantial and comparable community benefit…[to] the neighborhood,” in the form of a one-acre addition to the field at Benito Juarez High School. However, according to emails requested by the Pilsen Alliance from the city and later obtained by the Weekly, at the time their approval of PLUC members seemed to be unaware of what the pricing would be for the units in the building. They asked the developer to let them know what rents it would set—a full five months after the zoning change for the property had been approved by City Council. It is unlikely PLUC would have been able to conduct a substantial analysis to determine what could be an “equivalent” community benefit, if the pricing and how that would impact the community had yet to be released. This small insight into PLUC’s decision-making process highlights their lack of commitment to the decree put in place by members themselves and the uncertainty behind their motivations. The secrecy behind PLUC approving this project leaves many in the community feeling uneasy as to what new development will come to their community and how this will impact their lives. Following the critiques of their decision, PLUC released a statement in January 2017 saying they would “soon be opening up the process to more residents and organizations in order to have a completely transparent and inclusive process that will allow us to have a successful project after years of proposals that did not satisfy the community’s needs.” No “opening” of “the process” has occurred since, even though PLUC chairman Raul Raymundo asserted the necessity of transparency in a 2016 blog post defending the PLUC. The 18th and Peoria vacant lot has remained a flashpoint for gentrification in the neighborhood since Centro18 fell through, and it exemplifies PLUC’s lack of transparency. After Centro18 fell through, the land was bought in 2013 by the Midwest Jesuits, an order that runs Loyola University Chicago. The order originally planned to build housing for clergy on the site; by 2015, however, it had agreed to lease the land to a luxury developer, Property Markets Group (PMG), which intended to build a 500-unit development that was swiftly shot down by Solis and PLUC members. Mead-Lucero, the former PERRO organizer who now lives in Southern California, made similar points. “I don’t mean to coldly badmouth them, they do some really great work—TRP does tremendous work on providing affordable housing in the community, and so on—but they’re organizations that are tied to the alderman, ultimately, for funding streams and those kind of things, and they will only go so far to challenge the alderman,” he said.